A durable protective barrier against all weather conditions, including damaging UV rays and frost. Rainproof in 30 minutes. Protects for up to 5 years. Suitable for all exterior rough sawn timber. Approx coverage 6m2 per litre. 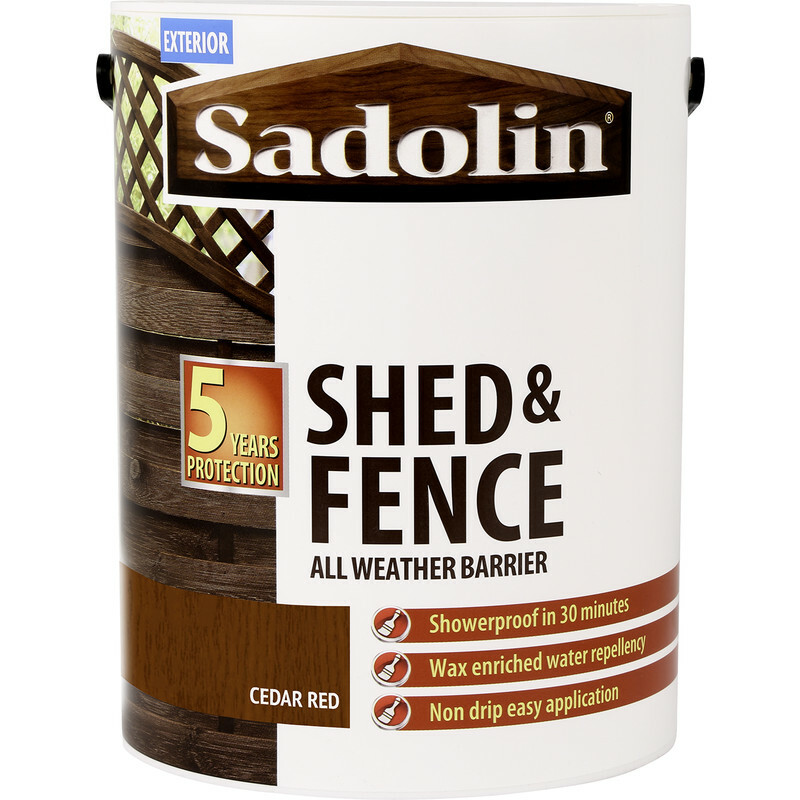 Sadolin Shed & Fence Treatment 5L Cedar Red is rated 4.5 out of 5 by 27. Rated 5 out of 5 by Aries8 from Great price I have used this on our decking and it covered using 2 coats to a great standard. Wasn’t sure if it would be any good on decking but it looks good and works a treat. Fraction of the price of some decking stains. Rated 5 out of 5 by Anonymous from Fantastic Value I bought this product to treat my garage door which had remained untreated for best part of 20 years. Coverage was excellent, quick drying and only required two coats to give a really pleasing finish. Highly recommended! Rated 5 out of 5 by michaelk from Excellent coverage and quick drying Purchased two tins approx 2 months apart. Found this paint to be easy to apply with excellent coverage. Easy to clean off the hands and clothes :-) touch dry in approx half hour and rain resistant at the same time. I purchased ebony colour, can't comment on how long the colour lasts. Rated 5 out of 5 by Pinkie from Sadolin Shed & Fence Treatment Sadolin is a quality product and that covers extremely well. Excellent value for money. Rated 1 out of 5 by millstone from Total rubbish. I've bought Sadolin products in the past and rate the manufacturer highly so this was an obvious choice for this project. I bought it to treat new stable doors and standards prior to fitting. After treating, they were kept under cover for 2-3 days before fitting so were 100% dry. The day after they were fitted, it rained heavily and it COMPLETELY washed off the woodwork and onto the horses. The product is not fit for purpose. Rated 1 out of 5 by millstone from Worst experience of any Sadolin product I've bought Sadolin products in the past and rate the manufacturer highly so this was an obvious choice for this project. I bought it to treat new stable doors and standards prior to fitting. After treating, they were kept under cover for 2-3 days before fitting so were 100% dry. The day after they were fitted, it rained heavily and it COMPLETELY washed off the woodwork and onto the horses. The product is not fit for purpose. Rated 5 out of 5 by Pinkie from Sadolin Shed & Fence Treatment Excellent quality product that covers extremely well. Good value for money. Rated 4 out of 5 by Anonymous from Good.....but not great... Colour and coverage is fine. However, they claim it to be non drip. Trust me..it's not! I would still recommend it though.